After the death of Maat-ka-Ra Hatshepsut Thutmosis III initiated the first changes in the temple. Apart from building of his own temple "Dsr-Ax.t" ("Holiest Horizon"; see photo below) Thutmosis III let erase nearly all of her representations and names. Her statues were removed and thrown near the temple of Hatshepsut into rock holes on the right of and on the left of the causeway. The first hiding place was discovered by the Egypt expedition of the Metropolitan Museum of Fine Arts headed by Herbert E. Winlock in the winter 1922-1923 who let examine a heap of debris which E. Naville had left during his earlier work at Deir el-Bahari. Winlock, whose interest applied for more the Middle Kingdom, was actually on the search for a suitable place for his own rubble and he wanted to be sure that nothing important was buried under it. Instead he discovered fragments of limestone and granite statues of Hatshepsut, which obviously were from Djeser djeseru. The first place of discovery was then called "Hole of Hatshepsut". In the excavation season 1926-1927 Winlock discovered another hiding place with fragments of statues of Hatshepsut when he let examine a hole north of the causeway that was called "Quarry of Senenmut". On the left of a colossal statue of Hatshepsut made of granite, found in the "Quarry of Senenmut" and assemble again from the fragments (photo: Metropolitan Museum of Fine Arts). Most fragments originate from these two find places, but pieces were distributed in the whole area. The Amarna period resulted in further destructions, i.e. all illustrations and names of gods were erased, under them also that the winged sun disk (bhdtj = "Behedeti"). The restoration of these representations begun in the reign of Haremhab or possibly already under Tutankhamun. According to the "official" succession of the kings the name of Hatshepsut became replaced in Djeser djeseru by those of the Thutmosid kings I - III. The restorations were continued under Ramses II and Merenptah, whereby the quality of the relief restored during the reign Haremhab is clearly much better than the quality achieved by his successors. Later - probably sometime during the 20. Dynasty - the temple was strongly destroyed, most likely by an earthquake. Thereafter, the area was used as cemetery. During the reign of Ptolemaic kings the temple was restored once more - which is testified still today by the decorations in the central chapel on the upper terrace - and rituals were started again. Among others the divine Imhotep (3. Dynasty) and Amenhotep, Son of Hapu (18. Dynasty) were worshipped in the ruins which probably indicates that original cult place of Amenhotep, his temple in the proximity of Medinet Habu, was destroyed. Beyond that an oracle was established. Ptolomaios VIII Euergetes (145 -116 B.C.) initiated numerous changes in the bark shrine (among other things new facings for the niches and the mouth of the oracle). In the courtyard in front of it a new portico was erected whereby the remains of the existing columns were re-used. 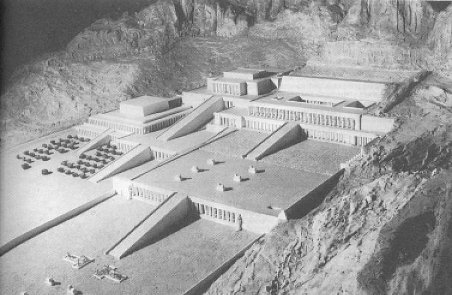 In this form the temple of Hatshepsut was probably in use as a sacred building up to year 2. A.D.. The last structural changes followed, when the ruins were adapted to the needs of a coptic monastery, dedicated to the holy Phoibammon. The monastery was founded probably at the end of the 6. century, most likely on the instruction of bishop Abraham of Hermonthis (Armant). 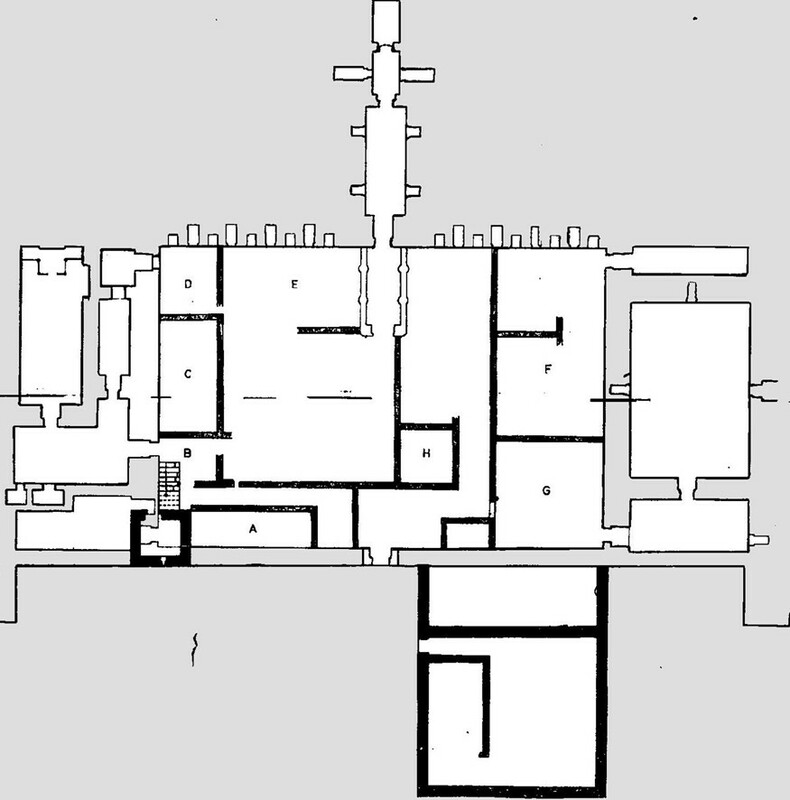 The living rooms of monastery were built on the upper terrace (see following figure, rooms A to G), the economic areas probably lay in the courtyard below. Probably, the monastery was in use for more than 2 centuries but its must have been in memory for a much longer time since the name of the place "Deir el-Bahari" means "Northern Monastery".